Pre-requisite: The class is designed for architecture and construction professionals and assumes a working knowledge of the design construction process and how to produce construction documentation. No Revit Experience is necessary, but we assume you have used CAD tools previously. If you have never used CAD or Revit please let us know in advance so we can direct you to materials to prepare for the class. Also, a working knowledge of Microsoft Windows. What’s included: Classes are 9-5 each day. We provide snacks and refreshments. We’ll take about 45-60 minute break for lunch and there are lots of options in the local area. Each attendee will get a certificate of completion. Each attendee will be provided a computer to use but you can also bring your own if you prefer. 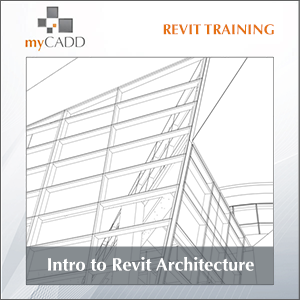 Attendees will also receive free retakes within 12 months, discounts on myCADD Revit Families and advanced training. Small class sizes – a maximum of 10. Download the Introduction to Revit Architecture PDF for class agenda.